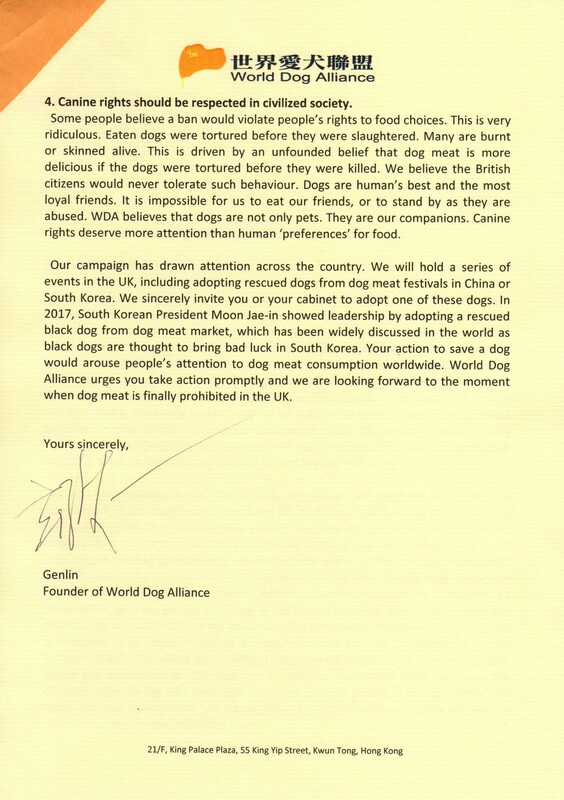 Why should the UK outlaw dog meat consumption? It is moral to ban dog meat. Around 30 million dogs are slaughtered for consumption each year across the world, of which 70% of these are stolen pets. Dogs destined to be consumed are usually housed and transported in a way that causes huge suffering, while some are confined to small, filthy cages with little food or water. There is a misconception that dog meat is tastier and contains better properties if the animals suffer high levels of stress whilst being killed. This results in horrific suffering for the animals, with dogs being tortured, boiled, skinned or blow torched alive. 2. A dog meat ban can close the legal loophole. Some animal welfare organisations suggest that current UK legislation is effective enough to prevent dog meat consumption in the UK because the sale of dog meat and the slaughter of dogs in abattoir is illegal. 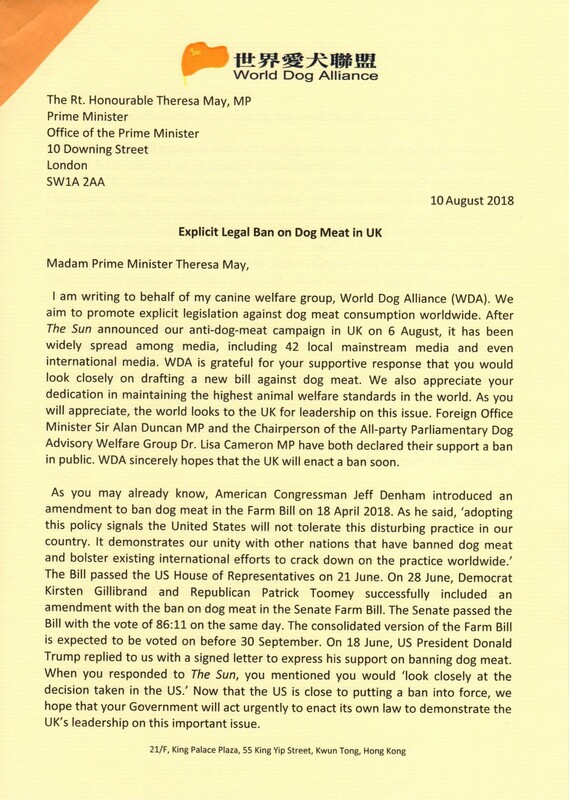 We accept that those laws provide a certain amount of protection, but we believe that there is a loophole in the law that needs closing through the introduction of a ban on the consumption of dog meat in the UK. While thankfully to date these practices have not been reported in the country, we want to ensure that it never happens. 3. Canine rights should be respected. Some people believe a ban would violate people’s rights to food choices. Dogs are humans’ best and the most loyal friends. It is impossible for us to eat our friends, or to stand by as they are abused. WDA believes that dogs are not only pets. They are our companions. Canine rights deserve more attention than human ‘preferences’ for food. 4. The legislation could maintain UK’s top animal welfare standard after the Brexit. 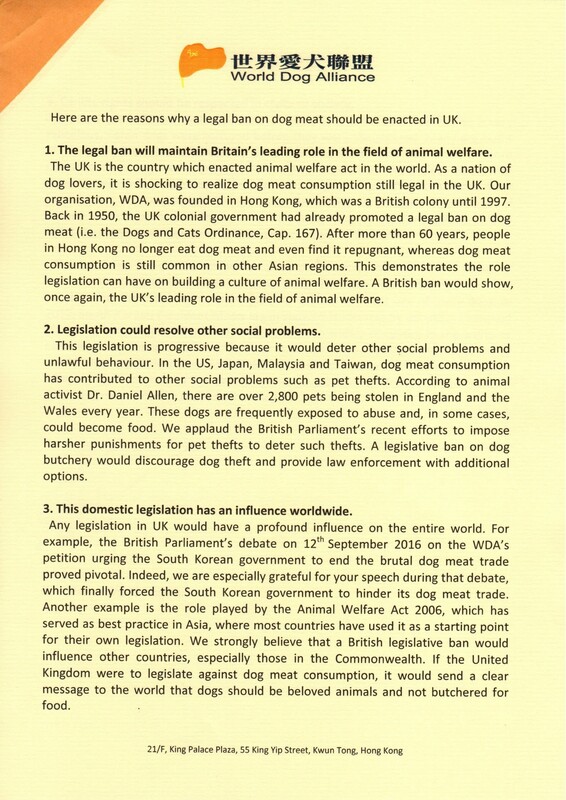 The UK is the country which enacted animal welfare act in the world. As a nation of dog lovers, it is shocking to realize dog meat consumption still legal in the UK. Downing Street has responded in public that Prime Minister Theresa May wishes to maintain UK’s top animal welfare standard. A British ban would show, once again, the UK’s leading role in the field of animal welfare. 5. Dog meat consumption has been legally-banned in other countries and regions. It is already illegal in countries across the world including Germany, Austria, Taiwan and Hong Kong, where British colonial government acted to outlaw the practice in 1950. South Australia also champions canine welfare, as they have banned the practice even though no cases of dog meat consumption have been reported. Soon it will be illegal in the US. The UK needs to follow these countries in enacting a ban if it is to keep its leading global role in animal welfare.